It’s made from 3/4” sanded plywood, I got this entire project out 3/4 of a sheet. The overall dimensions are 30” high x 30” wide x 10” deep. 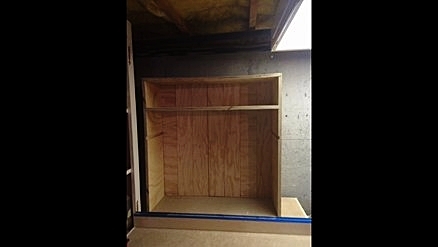 The sides are dado to receive the shelves and the back has a rabbit cut into each side to receive the back panel pieces. The back panel pieces are each 5” wide and I cut mating rabbits so they interlock so as that I can screw them into the frame. 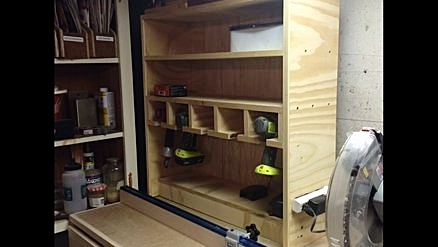 I incorporated 2 shelves for the drill batteries and accessories. I put a little platform in the bottom for the Chargers to sit and drilled holes out the back so as that I can run the cords to the power strip hanging at the right side. The tool holders are a series of dado joints secured by glue and screw so as that the drills and tools can sit on the wings.. The slot is 1.5” wide. I need to anchor the unit to the top of my mitre saw station and finish it with probably poly. Finally I added a 3/4” solid wood face frame to pretty it up and also hide some of the tablesaw burn marks on the ply..